The control of chemotherapy-induced nausea and vomiting (CINV) is critical in preventing poor health outcomes and increasing patient quality of life. The objective of this study was to evaluate the impact of the addition of casopitant to dual-combination therapy of dexamethasone and ondansetron on quality of life in patients receiving highly emetogenic chemotherapy (HEC). In a multicenter, double-blind, randomized, placebo-controlled, add-on trial (N = 810), patients were randomized to intravenous (IV) ondansetron/dexamethasone alone (control) or in combination with either a single 150-mg oral dose of casopitant or 3-day IV/oral casopitant. Quality of life was assessed as impact of nausea and vomiting on daily life using the Functional Living Index Emesis (FLIE) questionnaire. Patients completed the FLIE questionnaire at baseline prior to receiving chemotherapy and after completion of the first cycle of HEC. 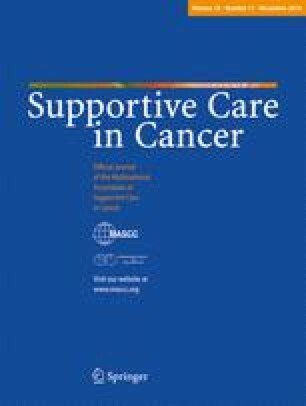 Patients in the single oral dose and 3-day IV/oral casopitant groups scored higher mean total FLIE scores (115.7 and 114.0, respectively; p ≤ 0.0332) than patients in the control group (107.5), indicating that casopitant patients experienced less impact from nausea and vomiting on daily life. The overall absolute difference in the proportion of patients reporting CINV with no impact on daily life between the single oral casopitant group and the control group was 13%; the difference between the 3-day IV/oral casopitant group and the control group was 14%. The addition of casopitant to ondansetron and dexamethasone in patients receiving HEC was significantly more effective in reducing the impact of nausea and vomiting on all daily life activities as assessed by the FLIE compared with ondansetron/dexamethasone dual therapy. Some of these data were presented at the International MASCC/ISOO symposium in Houston, TX, USA, June 26–28, 2008 and at the ESMO Congress in Stockholm, Sweden, September 12–16 2008. This study was supported by a research grant from GlaxoSmithKline. The authors acknowledge Kim Poinsett-Holmes, PharmD (Poinsett Publications, Inc.), for her editorial assistance with the submitted manuscript. This study was supported by a research grant from GlaxoSmithKline.